Blomsma Signs & Safety plays an active and leading role as part of the Blomsma Group in providing advice and realizing safety signage and process identification for over 25 years. The aim of the Board and its employees is to continue providing services to clients with innovation and commitment, using custom solutions and offering them a one-stop shop. 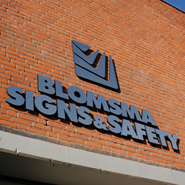 Blomsma Signs & Safety works according to the applicable legislation and regulations. We stay alert for developments in society, and we conform to the principles of Corporate Social Responsibility (CSR). We were doing so even before the concept of CSR existed. We look for sustainable solutions when giving advice and when realizing and delivering our products. This means ensuring both a high-quality, sustainable lifespan for the materials and respect for people and nature. 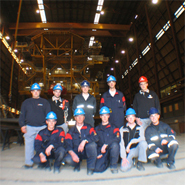 We work on large, complex projects and we have a leading position in the field. As a family company, we believe that continuity is more important than aiming to make as much profit as possible. That is why we want to be at the forefront of safety signage and process identification. We will continue to use the latest techniques, technical applications and materials. We are constantly making innovations in the printing technology and other production facilities that we have within the Blomsma Group. Our skilled workers can provide all types of health and safety signage, directional signage and other markings, based on an inventory and a consultancy process. As the co-founder of the Dutch Association for Safety Signage (NVVS: Nederlandse Vereniging voor VeiligheidsSignalisatie) and as an active participant in NEN (Dutch legislation) and ISO committees, Blomsma Signs & Safety helps ensure unambiguous use of health and safety signage. This means that we are thoroughly familiar with the national and international standards.